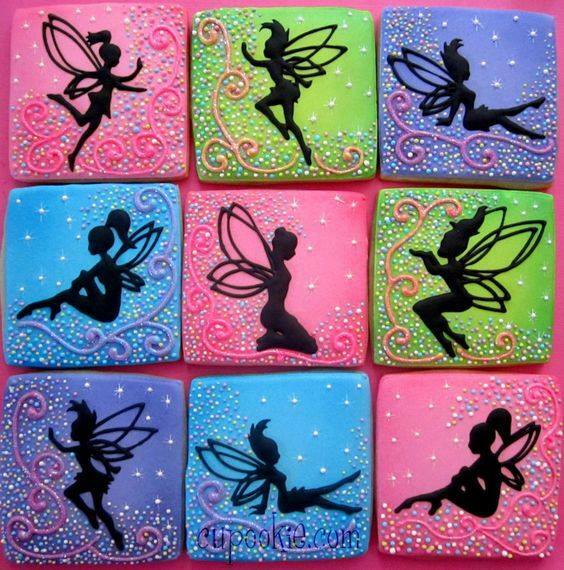 It's time for our first challenge of May over at the If You Give a Crafter a Cookie Challenge Blog and this one is all about Fairies. Our sponsor this month is A Day For Daisies and they have the sweetest variety of stamps, from fairies to books to flowers to mermaids. I hope you will take a look and maybe even be inspired to link up a project to this challenge. Someone who links up will be randomly chosen to win some digis from our sponsor. I have always loved moon designs and was immediately drawn to the Talking With The Moon digi. I love to paper-piece and this digi really lent itself to that technique. I especially loved the pinks and blues in our inspiration cookie photo as you can tell in my finished card. I printed the image on Neenah Stardust White cardstock and trimmed it to keep a small edge around it. 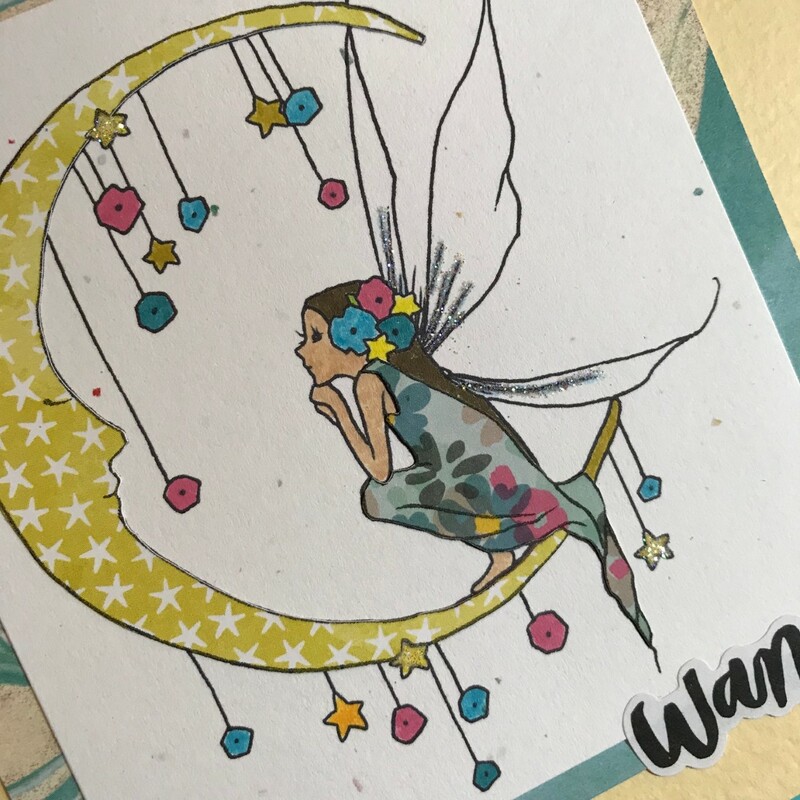 Using my favorite Faber-Castell PITT Artist pens and some Distress Markers, I colored in all of the image except for the moon and the fairy's dress. I love using scraps of paper ( that I call snibbles, which is what my mom called them ) . I also printed the image on a large enough scrap of yellow star paper and another of the blue floral paper in order to fussy-cut and paper-piece the moon and her dress. I used an older MAMBI cardstock paper pad to find a piece of marbled paper with colors to match the digital image. I cut the marbled cardstock to leave a small edge around the image. A piece of pale yellow cardstock was used as a card base to tie into the moon image. Dazzling Diamonds Glitter by Stampin' Up was used on the wings and several yellow stars to add a bit of shimmer. The word WANDER was found in my Memory Planning Sticker Book from MAMBI. I love to use planner goodies in my card designs. This is one of those cards that you have a rough idea for in your head and are really pleased at how it turns out !! I am sure that my teammate's have really done a fantastic job with this challenge . There were so many great digis to choose from. You can check them all out here , where you will also find links to each member's blog. 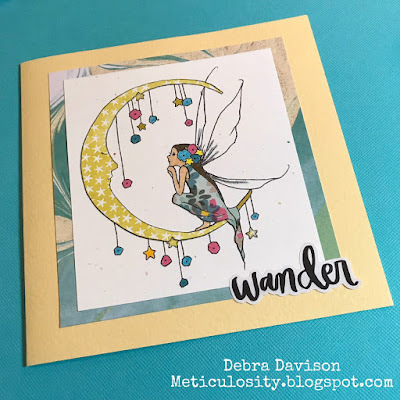 This challenge runs for 2 weeks and I hope you will link up a project - a card, planner page, tag or ATC. 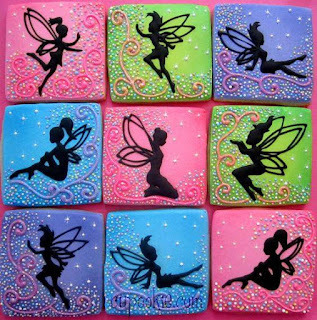 Whatever you are inspired to create from our amazing Fairy Cookie photo!! Thank you for visiting Meticulosity for this first May Challenge. Unicorn Coffee ?? Why, Yes Please ! !